Our work is driven by reliable data. And we follow it wherever it leads. We use it to identify problems and opportunities others have overlooked — and to target our resources, measure our success, and adjust our strategies. For instance: We’re helping gather better data on global deaths, half of which go unrecorded. Without that data, governments don’t know where to focus their efforts to save and improve lives — and they have no way to measure whether those efforts are effective. Working with partners, we’ve helped 20 countries that are home to more than one billion people improve their health data, which will pinpoint causes of death and disease and the best ways to prevent them. Data doesn’t give us all the answers — that requires creativity and innovative problem-solving. But data and facts anchor our thinking to reality at a time when political debate is increasingly untethered to them — especially in the U.S. The year 2017 brought us the phrase “alternative facts.“ The phrase essentially means that people are free to make up their own reality based on what they wish the world to be. Up can be down, black can be white, true can be false. The late New York Senator Daniel Patrick Moynihan once said, “People are entitled to their own opinions, but not their own facts.“ That didn’t used to be a controversial statement. Of course, there has always been spin in politics, but this is different: It’s a direct assault on facts and data. And the increasing disdain for facts is making it harder for America to address major challenges here and around the world, including those that our foundation focuses on. Fortunately, however, while the assault is concentrated in Washington, a counter-assault is under way in both red and blue states. It’s being driven from the ground up, and we’ve only just begun to capitalize on its potential. While it doesn’t attract national headlines, there is a growing movement of big cities and small towns that are striving to use data to improve the performance of government and the lives of their citizens. Unlike those in Washington, mayors and other local officials cannot get away with constructing alternate realities or playing partisan games. They are the officials most directly responsible for the services people depend on, and their success is measured in real time: whether streets are safe, the air is clean, roads are in good condition, and students are graduating from school. When a child suffers from asthma caused by dirty air, parents call the mayor, not their member of Congress. Local leaders have no incentive to build policies based on misinformation, because they have nowhere to hide from bad results. Because they are held accountable, local leaders also tend to be more willing to work with members of other political parties and to experiment with bold new ideas — wherever they come from. That makes city halls more nimble, more pragmatic, more responsive to public concerns, more open to experimentation, and more committed to using data than national governments. It also makes them great, though often overlooked, partners for foundations. 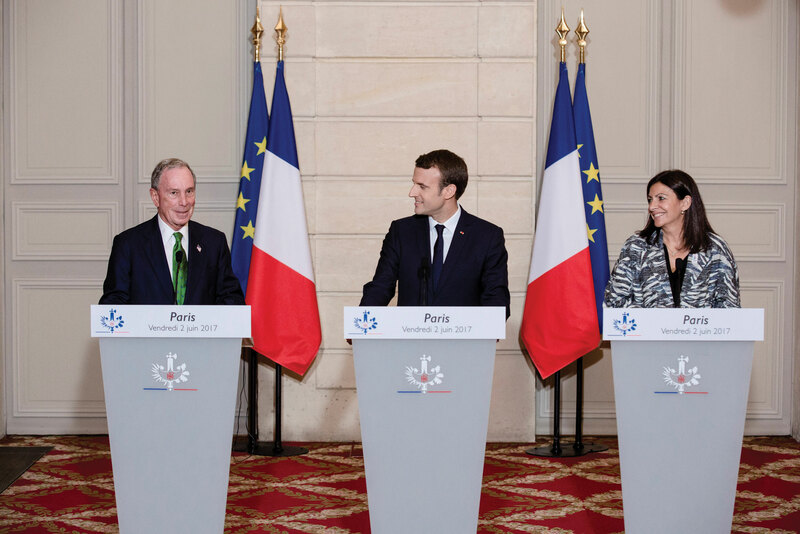 Mike Bloomberg announcing that the U.S. will still meet its global climate commitments alongside French President Emmanuel Macron and Paris Mayor Anne Hidalgo. Cities around the world have long been a major focus of our work, and, last year, we placed special emphasis on expanding our efforts domestically. In 2017, we launched the Bloomberg American Cities Initiative, with a budget of $200 million. It’s the largest-ever philanthropic effort to support mayors and city halls — and the timing is not coincidental. As Washington has grown more dysfunctional, American cities have grown more dynamic. Mayors in both parties are leading where Washington won’t, and they are working across the aisle in ways that Washington wouldn’t dare. The result is that, to the extent we are making progress as a nation, local governments are often driving it. We can effect enormous change in the country as a whole by focusing on local communities — and that’s the purpose of the Bloomberg American Cities Initiative. Through a wide variety of programs, we’re making investments in city halls and helping to give them the tools they need — including the capacity to use data more effectively — to drive progress and innovation. We’re also working to advance innovative local policies and legislation on a broad range of issues. And we’re spreading the most successful solutions to communities far and wide. While political turbulence in Washington has dominated the headlines, the hard work being done by cities is quietly proving to be a powerful counterweight. For example: After President Trump announced his intention to withdraw from the Paris Agreement on climate change, we joined with California Governor Jerry Brown to launch an effort called America’s Pledge. Our coalition includes more than 2,500 U.S. cities, states, businesses, and universities that have committed to the goal America set in Paris. If the group was a country, it would have the third-largest economy in the world — and just like every country that signed the Paris Agreement, our coalition will measure the progress we are making and report it to the U.N. Last year at the U.N. Climate Change Conference in Bonn, Germany, U.N. officials recognized our efforts and accepted our first report. The fight against climate change illustrates an important recent shift in the power structure of global affairs. Over the last few years, as alliances between nations have been strained by isolationism and national governments have been slow to address big challenges, local governments are playing a larger role in international relations. Mayors are working more closely together than ever before, across borders and oceans. Mayors meeting with Mike Bloomberg and Patti Harris in New York City for the Bloomberg Harvard City Leadership Initiative. Our foundation is helping them to do that by supporting networks — such as the Partnership for Healthy Cities — that bring cities together to tackle critical issues and spread proven policies globally. We’re supporting researchers and practitioners — like those in the Bloomberg American Health Initiative at Johns Hopkins University — who are working together and with local leaders to reverse the recent decline in U.S. life expectancy. We’re partnering with top colleges to expand access and opportunity by helping them attract talent from every zip code. Through Bloomberg Associates, we’re providing mayors with consulting from leading experts to help cities tackle their biggest challenges. And we are also empowering cities to pursue new ideas and approaches, which we incentivize through competitions like the Mayors Challenge and the Public Art Challenge. The majority of the world’s people now live in cities for the first time in history. As cities of all sizes grow in both population and power, Bloomberg Philanthropies will continue finding new ways to help them. And here in the U.S., we will continue driving progress from the bottom up by supporting leaders in both parties who respect facts and data — and who have the courage to use them. Connect with Mike Bloomberg on Twitter, Facebook, Instagram, and LinkedIn. At Bloomberg Philanthropies we believe that collaboration has an exponential effect on everything that we do. We know that when we join with strong partners we’re more than the sum of our parts — and that leads to real impact around the world. 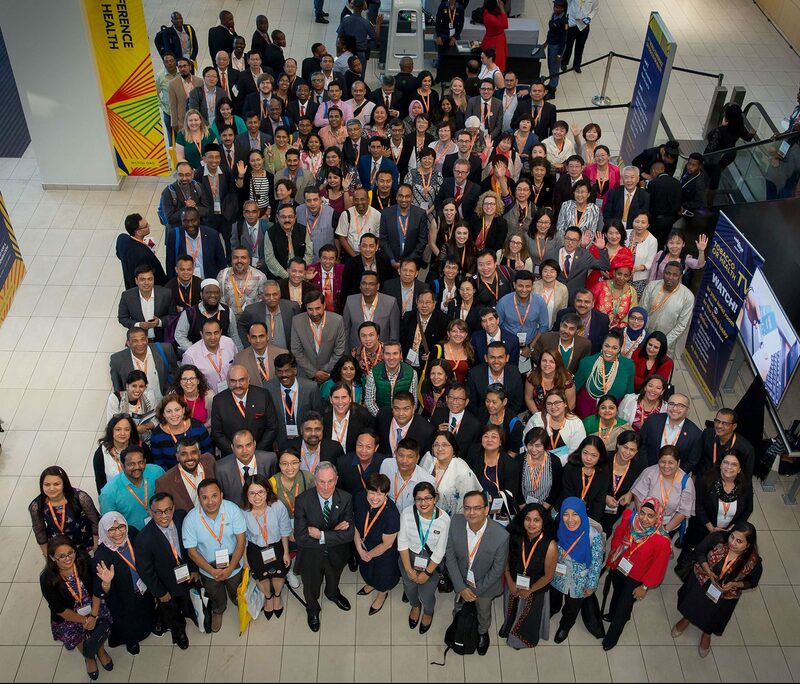 Recently, we traveled to Cape Town, South Africa, for the World Conference on Tobacco or Health. At this gathering of global public health experts, we honored six countries for their efforts to protect citizens from the dangers of tobacco use by implementing strong tobacco control measures. Amid the buzz of the conference, we took some time to meet with more than 100 partners from 23 countries whose work we support. They were there to connect and share their successes in reducing tobacco use with one another. The billion dollar Bloomberg Initiative to Reduce Tobacco Use is a great example of our belief that our work is most effective when we’re acting as a hub, bringing together organizations and individuals. Sometimes these are longtime collaborators who work with us on big challenges like tobacco control or closing coal plants across the U.S. and Europe. Others are new partners that we connect to brainstorm innovative approaches to challenges as they arise. Bloomberg Initiative to Reduce Tobacco Use partners meeting with Mike Bloomberg in Cape Town, South Africa, at the World Conference on Tobacco or Health. For instance: A few years ago, we assembled a small cluster of college presidents who were committed to enrolling and graduating high-achieving, lower-income students. 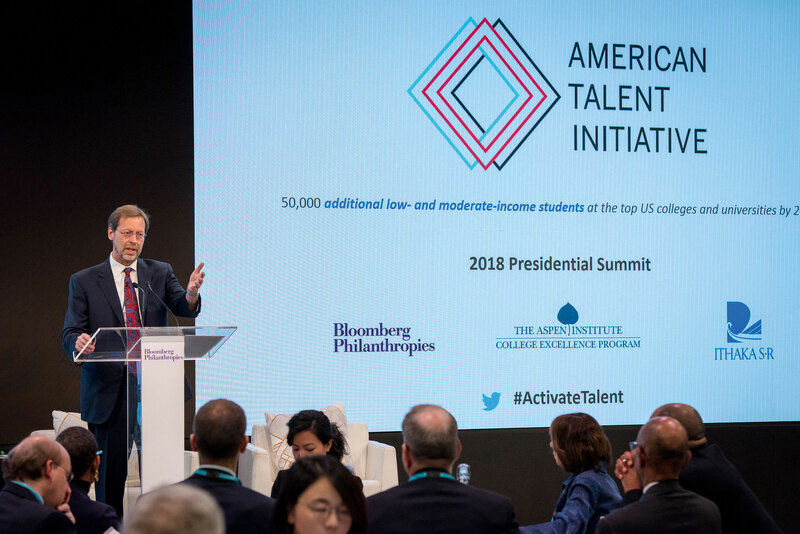 That conversation led to the creation of the American Talent Initiative, a group that today boasts a hundred colleges — all working to expand access and opportunity for thousands of students. We know we can achieve much more working together than we can apart, and philanthropy has a critical role to play. It’s through many remarkable collaborations that over the past year we’ve been able to produce some powerful results. In the U.S., we supported the leadership of cities through the launch of the Bloomberg American Cities Initiative — our focused approach to strengthen U.S. cities through bold leadership, smart policies, and the involvement of residents. The first step in this initiative was bringing our Mayors Challenge back to the U.S. where we first launched this cities ideas competition. 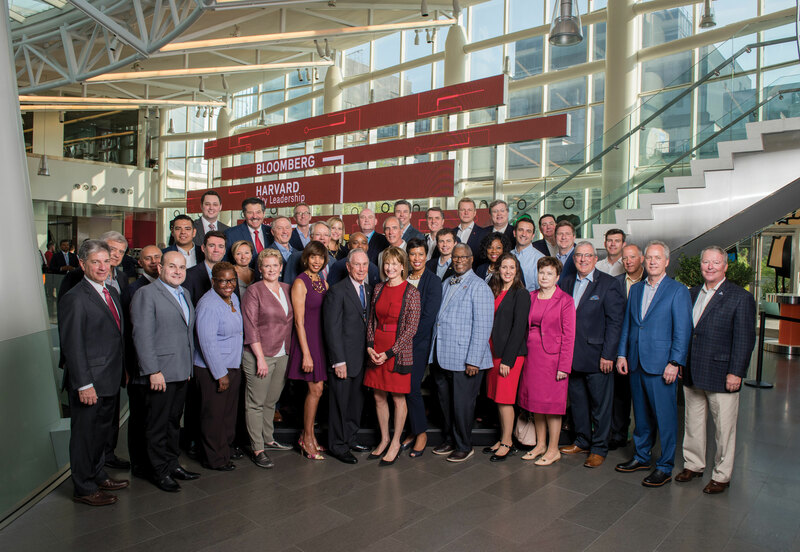 Through an incredible partnership with Harvard Business School and the Harvard Kennedy School of Government, we assembled the first class of our Bloomberg Harvard City Leadership Initiative, providing a yearlong leadership development training program to mayors and their teams from 40 cities across the globe. It was wonderful to see mayors come together in a classroom and — without the distractions of their cell phones — learn from some of the brightest professors in the world while reflecting on their unique leadership experiences with one another. 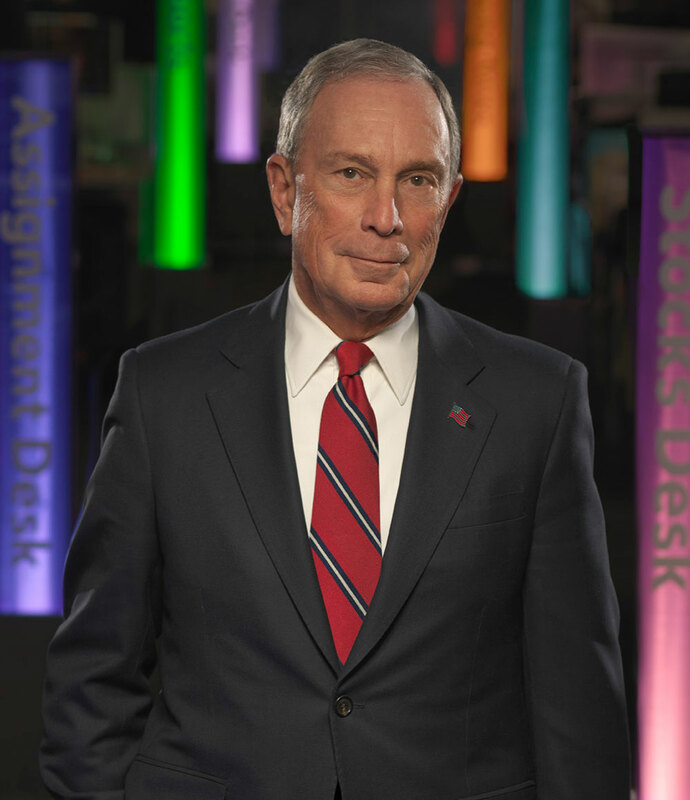 Bloomberg Associates — our collection of world-class experts, including former officials from New York City Hall — worked in nine cities around the world, providing in-depth consultation and mentorship to mayors and their teams. We launched our second Public Art Challenge, encouraging hundreds of cities across the U.S. to apply. Building on the success of the first challenge, this competition spurs mayors to work with artists to create temporary public art installations that celebrate creativity, enhance community identity, encourage public-private partnerships, and strengthen local economies. In our environment work, we increased our commitment to the Beyond Coal campaign in the U.S. and expanded it to combat coal-fired power globally, starting first in Europe — where we’ve already helped to close some of the continent’s dirtiest plants. In the U.S., through this effort, more than half of all coal plants have announced planned closures since 2010. This initiative has helped make progress in reducing emissions — progress that we were able to highlight through America’s Pledge, the coalition that Mike launched with California Governor Jerry Brown to bring together cities, states, and businesses to make sure that the U.S. meets its global climate commitments. In education, in addition to rallying top colleges to attract, enroll, and graduate high-achieving, lower-income students through the American Talent Initiative, we’re helping to increase the number of these students applying to top schools by investing in virtual college advisors through our CollegePoint program. Since the program started in 2014, we’ve enrolled more than 36,000 students. Franklin & Marshall College President Daniel Porterfield speaking at a convening of college presidents as part of the American Talent Initiative. Building on Mike’s role as World Health Organization Global Ambassador for Noncommunicable Diseases, in 2017, we launched the Partnership for Healthy Cities. So far, more than 50 cities from across the world have agreed to implement at least one policy proven to prevent noncommunicable diseases or injuries — like increasing seat-belt use or banning tobacco ads — as well as share lessons with one another. And our Women’s Economic Development program celebrated its tenth year of providing economic and rights training to women in Sub-Saharan Africa. This effort helps women achieve economic independence through work, bettering their lives and those of their families. Over the past decade, nearly 200,000 women have participated in our initiative’s training programs. When back-to-back hurricanes struck the U.S. Virgin Islands, Mike and Bloomberg L.P. Co-Founder and Vice Chairman Tom Secunda mobilized the Bloomberg team to deliver supplies and expertise to get the community back on its feet. Thanks to these efforts, we were able to help restore power twice as fast as any other part of the region affected by the storms. Across Bloomberg L.P., a culture of service and giving back is thriving. In 2017, 12,041 employees volunteered with 2,300 nonprofit partners, making invaluable contributions to the communities where they live and work. One of those communities — London — has a new cultural space, called London Mithraeum Bloomberg SPACE, which we’ve opened and made free to the public. It’s housed under the company’s new European headquarters and features access to the Temple of Mithras, Roman artifacts discovered during the excavation of the building’s foundation, and contemporary art commissions. Throughout this report, you will have a chance to learn more about these and many other efforts in cities and communities across the globe. The truth is, no one believes in the power of cities and local leaders more than Mike Bloomberg — as you read in his letter. And this year’s cover creatively depicts an imagined city — both dreamt up and dotted with icons of a handful of places where we work. Be sure to look closely! 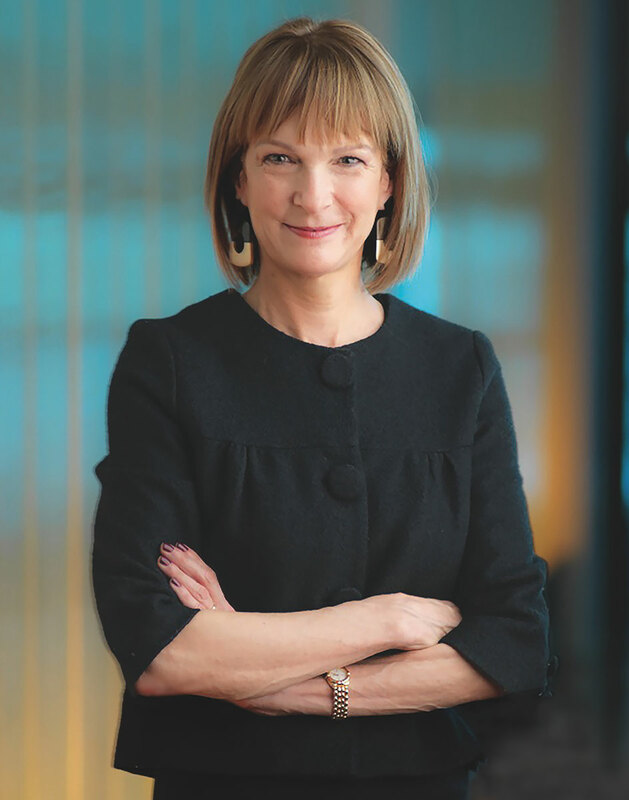 Right here, though, it’s important to recognize that we could not do this work without the dedication of the best team imaginable, including all of our colleagues at Bloomberg L.P. With the vast majority of the company’s profits going to our work saving and improving lives, it is their hard work and success that makes all of our efforts possible. Thank you for reading this year’s annual report. Connect with Patti Harris on Twitter, Facebook, and LinkedIn.